The Canberra Raiders are an Australian professional rugby league football club based in the city of Canberra, Australian Capital Territory. They compete in Australasia's elite rugby league competition, the National Rugby League (NRL) premiership. The Raiders' current home ground is Canberra Stadium in Bruce. Previously, the team played home matches at Seiffert Oval in Queanbeyan, New South Wales, with the move to Canberra Stadium taking place in 1990. 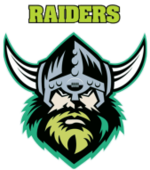 The official symbol for the Canberra Raiders is the Viking. The Viking, also a mascot at Raiders' games, is known as Victor the Viking. As part of the New South Wales Rugby Football League premiership's first expansion outside Sydney, the Raiders were admitted to the League, along with the Illawarra Steelers in 1982. Over the following years they improved steadily, becoming the first non-Sydney team to make the finals (1984), feature in a grand final (1987) and win a premiership (1989). This heralded a period of great success for the club, with four grand final appearances and three premierships in eight years. During this period, the Raiders boasted international players such as Mal Meninga, Laurie Daley, Ricky Stuart, Glenn Lazarus and Steve Walters. After this came the Super League war, with the Raiders switching to the rebel competition before continuing to compete in the re-unified NRL. In the past decade, the Raiders have suffered from an exodus of experience. At the beginning of the 2009 season, the Raiders squad contained only four players who have played at the representative level. Joel Monaghan and Terry Campese each represented the Australian side during the 2008 Rugby League World Cup, with Monaghan also playing for the NSW blues during the third game of the 2008 State of Origin Series. Also, Bronson Harrison has represented New Zealand. However call ups for captain Alan Tongue to Country Origin, David Shillington to the Queensland State of Origin side and Tom Learoyd-Lahrs to the New South Wales Origin side now sees the Raiders with a solid spread of representative players in their squad.